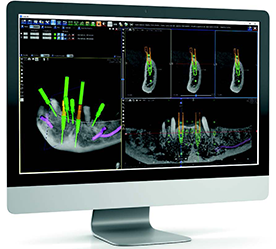 LA Imaging center utilizes Guided Implant Surgery Software which allows the dentist to diagnose and plan implant cases virtually in 3D tutorial. We are then able to transfer those 3D virtual plans to the patient’s mouth using an implant surgical guide made by using 3D printing technology. LA Imaging surgical guides are increasing the accuracy and predictability of placing dental implants.